Search engine big-boys Yahoo have unveiled a shopping site for consumer electronics backed up by expert advice and user-contributed reviews. Shoving their size nines into a market long dominated by CNet Networks, the new Yahoo! 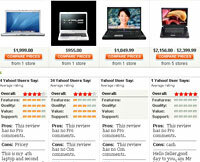 Tech shopping and advice Website will offer hundreds of thousands of products with user ratings and reviews. Yahoo is hoping that by offering a site free of the spoddy techno-jargon of gadget enthusiast sites, consumers will warm to their no-nonsense, straightforward approach. “What we are trying to do is to make it simple to choose and use the technology that is easiest to use,” said Patrick Houston, general manager of Yahoo! Tech, formerly editor in chief at CNet. “We built Yahoo! Tech for people who might not have the time nor inclination to learn about bits and bytes,” he added. The magazine-style site will use Yahoo’s tried and trusted community tools to help users find information about products and prices and share their opinions with friends, family and other consumers. Using an attractive and simple interface, products can be sorted and filtered by price, brand and expert rating with the option to compare online prices for the best deal. Where consumers are looking to spend money, advertisers are always ready and willing to slap up enticing banner ads, and Hewlett Packard, Verizon Wireless and Panasonic have already signed up. Yahoo will be populating the site with content from “trustworthy publications from around the Web who may or may not be official content partners,” as well as their own staff editors and writers, and Yahoo! users. The company is also reported to have licensed reviews from the “Dummies” series of How-to books, Consumer Reports, PC World and PC Magazine. The new Yahoo! Tech is currently focussed on the U.S. market, with Houston saying that there are no imminent plans to expand into other countries.